Oscar nominations: Bigelow and Tarantino snubbed, Affleck likely sad. 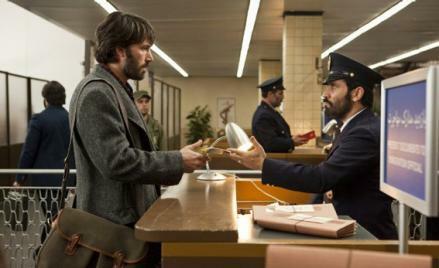 Argo got plenty of Oscar recognition, but not for its actor-director. What a lucky break that the announcement of this year’s Academy Award nominees happened to coincide with the week of Movie Club. This time, instead of responding to the choices in an early-morning vacuum (ah, the ineffable loneliness of that dark, echoey room where industry types gather at 5:30 a.m. to hear the words of the Delphic oracle! ), I get to kibitz and dissect the nominations with you all. It’s like getting to sit on the bleachers with the coolest kids in school during prom. So I propose we take a break from our conversation of the year’s movies for a lightning round of Oscar talk. What were the surprises? For me, the biggest ones came in the best director category—nary a nomination for Kathryn Bigelow, Quentin Tarantino, or Tom Hooper, making it unlikely that any of their films will take the big prize (since winners in the Best Picture category have generally tended to be nominated for their directing as well). And Benh Zeitlin and David O. Russell—the former a 30-year-old Hollywood outsider, the latter a notorious hothead not known for his people-pleasing skills—were unexpected inclusions on the list for, respectively, Beasts of the Southern Wild and Silver Linings Playbook. Ben Affleck, whose Argo got a surprising amount of recognition in other categories (Best Picture, Best Adapted Screenplay, Best Score, Best Editing, and a Best Supporting nom for Alan Arkin), was also shut out here. Wonder if he’ll spend the day in a soul-searching, whiskey-pounding cigarette-smoking funk, like the long dark night his CIA-agent character in Argo spends in a Tehran hotel room on the eve of the big rescue operation. If so, I hope today’s sulking session is better acted. I try not to get involved with this yearly rite too personally, because that way madness lies, but I’ll allow that I’m sad Matthew McConaughey (whose sleazy appeal Wesley nailed in his last post) got no recog for his magnificent supporting turn as Dallas, the strip-club impresario in Magic Mike. And while Django Unchained was far from my favorite movie of the year, one area in which it indisputably shone was supporting performances—sure, Christoph Waltz earned his nomination, but it would’ve been great to see Sam Jackson or Leonardo DiCaprio up there too, especially since Waltz has already won. If you were Bing Crosby dreaming of a white Oscars, you’d nearly have your wish: except for 9-year-old Quvenzhané Wallis, a surprise Best Actress nominee for Beasts of the Southern Wild, and Denzel Washington, a Best Actor contender for the otherwise unnominated Flight, this year’s field of nominees is looking pretty pasty. Still, there were small bursts of joy in this morning’s announcements, like, for me, the recognition of the great Australian actress Jacki Weaver for her small but pivotal role as Bradley Cooper’s loving, hovering, enabling mother in Silver Linings Playbook. Crabby snacks and homemades all around! And while everyone knew Adele’s “Skyfall” would get a nomination for Best Song (given that there is no category for BEST SONG EVER), isn’t it a joy to know that the recently postpartum Ms. Adkins will be up on the Oscar stage on Feb. 24 in some humongous bouffant, belting that gloriously nihilistic, addictively catchy ballad? (That’s provided, of course, that the producers of the ceremony are wise enough to reverse last year’s idiotic decision to scrap live musical performances, thereby depriving millions of a chance to hear Jason Segel deliver an onstage rendition of the fabulous winning song, “Man or Muppet?.”) Keith, Wesley, Stephanie: Are you ready to stand tall and face it all together?